This recipe is from another friend (Char). I loved it so much that I took the recipe and I made it at every other get-together and many of my friends liked it. It is so easy to make. I think this is so easy even a novice can make it. My experience with this pudding the first time was that instead of using the cool whip in the tub I accidently misread the recipe and bought whipping cream which is in the can. Duhhhhhh I should kick myself for not reading the recipe properly. But as I said this recipe is so easy nothing can go wrong. It tasted good. The next time I made it with cool Whip it tasted even better. Line the bottom and sides of a large bowl with cake slices. Add a layer of pudding mixture. Spread 3/4 of the pie filling on cake slices at the bottom of the bowl. Add another layer of cake slices. Layer the fresh fruit on top of the cake slices, spread the remaining pie filling over the fresh fruit, add another layer of cake slices, then spread the remaining pudding on the top, making sure it reaches the side of the bowl to seal in the flavors. Keep in the fridge overnight for more flavor. 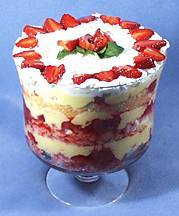 Traditional trifle calls for liquor to be drizzled over the bottom and second layers of cake slices. I didn't do that. You can if you want to.